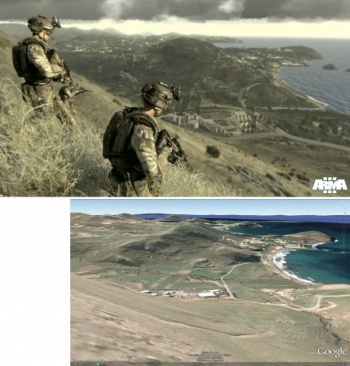 Arma III includes an accurate map of Lemnos, and the Lemnians don't like it. Bohemia Interactive Studio's Arma series has always prided itself on realism. The weapons wielded by the armed forces in the game are based on what they would use on operations, with accurate bullet drop-off and penetration. The latest game, Arma III, is no different and the plot focuses on NATO operations against forces operating on the small Greek island of Lemnos. Unfortunately, the present population of Lemnos is upset that Arma III will show the countryside in such detail in a game featuring war when the island has a peaceful place in Greek culture and myth. "We cannot fathom that our island, a place of peace and creation, will be turned into a scene for violence and battle," said Antonis Hatzidiamantis, the mayor of Lemnos. "We reserve our legal rights to defend our island's reputation." Lemnos is important to the Greek god of metalwork and crafting, Hephaestus, and the volcanic island was home to the deity's forge. According to myth, Hephaestus fell on Lemnos when Zeus threw him out of Olympus. Perhaps more importantly, the Lemnians have concerns over the very fidelity that Bohemia Interactive instills in the Arma series, especially with the island's proximity to the Turkish mainland. "There are national reasons to keep certain areas on the island secure but [in the game] they are shown in high-definition," said the head of the town council. "There could possibly be problems with national security." In contrast, there is no word whether the Lemnians have a problem with Hephaestus' portrayal by Rip Torn in God of War III or the general mangling of Greek myths committed by Sony's series.